Enjoying some of the richest marine biodiversity in the world, the Maldives has the seventh largest coral reef system on the planet. In 2012, Maldives announced the global pledge to declare the whole of Maldives as a UNESCO Biosphere Reserve by 2017. The Biosphere Reserve offers the opportunity to create and build on beneficial effects of coral reef ecosystem services by contributing to their protection and conservation. To celebrate World Tourism Day 2016, Vabbinfaru, Ihuru and Velavaru were among 27 resorts to sign a pledge to include part or all of our housereefs within this framework in 2017. Since then, we have provided technical and logistical support to the Ministry of Environment and Energy, EPA, Ministry of Fisheries and Agriculture and the IUCN to develop monitoring protocols, deliver training workshops to enhance capacity, and assisted in the first biological assessments of the South Ari Marine Protected Area (SAMPA) to develop a marine management plan and to assess its eligibility as a Biosphere Reserve. In one week, the team surveyed 40km of reefs with a combination of rapid and detailed assessments, discovering reefs untouched by the recent coral bleaching, recording 345 species of fish, and sharing the water with manta rays and whale sharks! 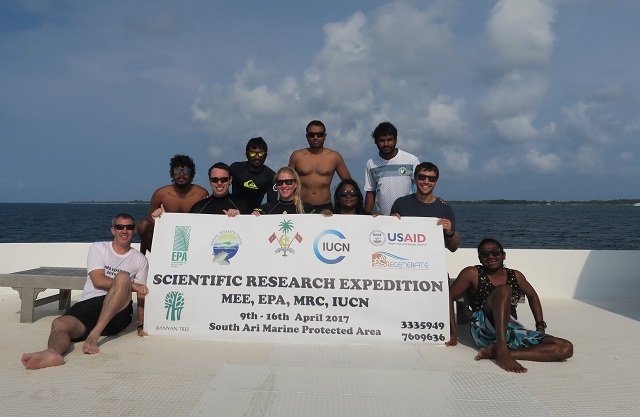 This is undoubtedly an important area that will contribute to the recovery of Maldivian reefs not just locally but nationally.